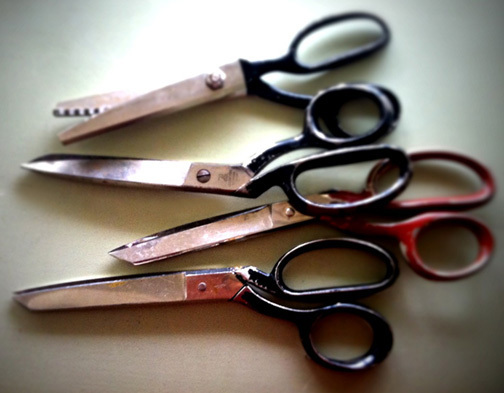 Over the past few weeks I've been to a number of Op Shops around Melbourne, and buying old scissors has become harder than I imagined - unfortunately a lot of Op Shops don't put scissors or knives out any more because they are potential weapons!!!! Some Op Shops are even going as far as throwing them out which is such a shame because they have so much character and look amazing... Thankfully a few Op Shops have seen reason and keep them out the back (or still just put them out) - and may produce them if you ask nicely - one Op Shop produced 3pairs for me which was lovely and another is kindly holding a pair for me... I think if people are taking the time to donate these beautiful old scissors they shouldn't be thrown in the bin!! !